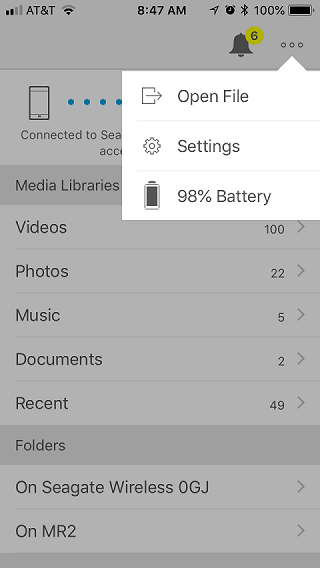 iOS devices can use the free Seagate Media app to easily connect to the drive and view multimedia files and documents. Videos can be either copied or streamed directly from the drive, giving you the ability to carry around a massive library of content to watch or share. If you start running low on storage space on your iPhone or iPad, storage-hogging video clips can be moved to the drive for off-line storage, freeing up precious space on your mobile device. Other wireless computing devices can connect to the drive via its built-in "Seagate" wireless access point. This access point can be configured with an existing wireless internet connection so that internet requests on your phone or tablet can proxy through the drive allowing simultaneous storage and internet connectivity. The Seagate wireless access point can be password protected; however, this protection can be bypassed by anyone with physical access to the drive by inserting a paper clip into the pin hole on the bottom of the device. Doing so will reset the wireless defaults, exposing an open wireless connection. In my remote testing of occasional storage and streaming, I found the drive battery (with the drive's ECO power saving option enabled) to last several hours without a recharge. I was also able to connect my iOS, Android, and wireless laptop devices simultaneously to the drive (up to eight devices can be wirelessly connected to the drive at the same time), turning it into a portable Network-Attached Storage (NAS) device. Considering such functionality was something out of a science fiction novel twenty years ago, it's pretty remarkable that this flexible, powerful product even exists! Another nifty feature (once an automated firmware update was applied) is the ability to connect Dropbox or Google Drive to automatically sync files on the drive to either of these services. Unfortunately Apple's iCloud and Microsoft's OneDrive services are not currently supported. Once configured, this works seamlessly as long as the drive is connected to the internet. Mac users should be aware that the Seagate device is pre-formatted in NTFS, which is read-only in macOS. Mac users will either need to install the free Paragon NTFS driver for Mac (the installer is available on the drive itself) or reformat the drive in macOS's native Extended file format instead. The only minor concern I had using the drive in its intended portable state is its lack of protection from accidental drops or spills. Given the device's mobile intent, it would have been nice to either include the sleeve in the package or incorporate it directly into the drive enclosure itself. Also, since the device weighs more than half a pound, it would have been useful if Seagate offered a port to share its battery charge with mobile devices connecting to it. Regardless of the minor issues and wishlist items that perhaps could be included in the next iteration of the product, Seagate's Wireless Plus 2TB Storage device is a remarkably flexible portable storage device that will be sure to satisfy hungry media-consuming and copious video-and-photo-generating users. 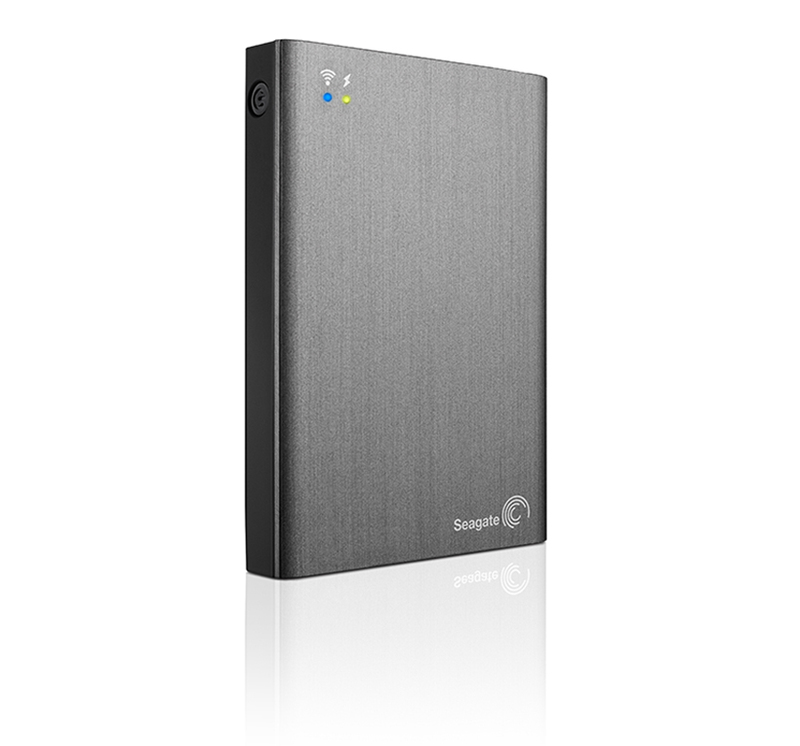 Its cross-platform, non-proprietary storage approach makes it as easy to use as any other portable drive with the added benefit of operating in a truly wireless mode. Recommended.